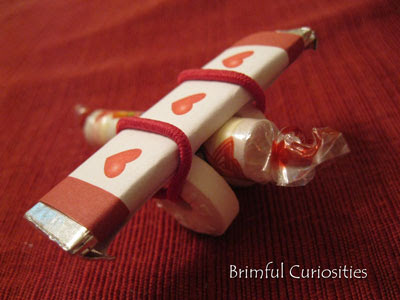 While looking for cute Valentine's Day ideas I came across directions for a candy airplane valentine on the Family Fun website. I remember making similar airplanes when I was a kid and, if my memory serves me correctly, I believe that I first learned to make them in Girl Scouts. 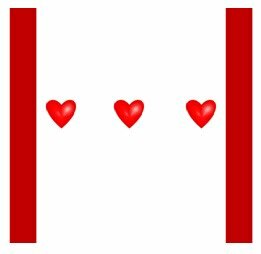 I created and printed a special heart Valentine themed gum wrapper cover like the one shown on the Family Fun site to add to our airplanes (click on the image to see the jpg and print). I think the decorated wrapper helps the airplane look prettier for Valentine's Day. The airplane is a little tricky to assemble and is probably a project suited more for older kids, but my kids enjoyed watching me make them and they really, really had a blast playing with them! I think I'll make a few more so my son can give them to his friends for Valentine's Day. It's plane to see - I want you for my Valentine. Up, up and away! Happy Valentine's Day! Above all, I want you for My Valentine. Have a high flying Valentine's Day! Valentine, my heart soars for you! 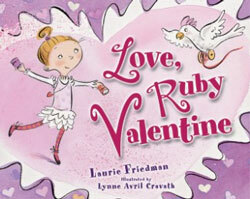 We started reading several Valentine's Day books last week. One of my daughter's favorite books from library included an illustration of the main character in an airplane spreading Valentine cheer. How fun is that? Ruby Valentine spends her time counting down to Valentine's Day by making Valentines (along with some help from her pet bird, Lovebird). Cards, cookies and treats -- Ruby Valentine is the queen of Valentine's Day. She loves to spread Valentine's Day cheer by bringing Valentines to the people in a nearby town. Exhausted from all her hard work, she falls asleep and misses Valentine's Day. Lovebird helps her realize that she doesn't have to wait for the next Valentine's Day to share the love. This book has a very sweet message that I think all kids and parents need to remember: "Saying, `I love you!' doesn't have to wait 'til Valentine's, any day will do." The story, told in rhyme, is extraordinarily cute, and the cheerful illustrations will make you want to get out your crafting supplies, create a wagon-load of valentines and throw them from an airplane, just like Ruby Valentine. 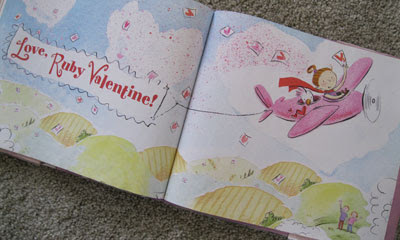 Do you know of any other Valentine picture books that show an illustration of an airplane? We ran across another cute one today with an airplane - The Ballad of Valentine by Alison Jackson, illustrated by Tricia Tusa. What a sweet idea for an airplane. I suppose one could use a fruit roll (the one that is rectangular) instead of a gum for a somewhat healthier version. The book looks interesting too. I have to dig Valentine books out this weekend. Very cute aeroplane! Valentines are not nearly so big over here in the UK (for example kids definitely don't give them to their classmates), but I'd be thrilled if I received one of these. So cute! If I was still in the classroom, this would definitely something I'd do with or for my kiddos, depending on their age. I have been thinking about looking for Valentine books to review this week; thanks for giving me a kickstart! Cute! Great sayings to go with them too.